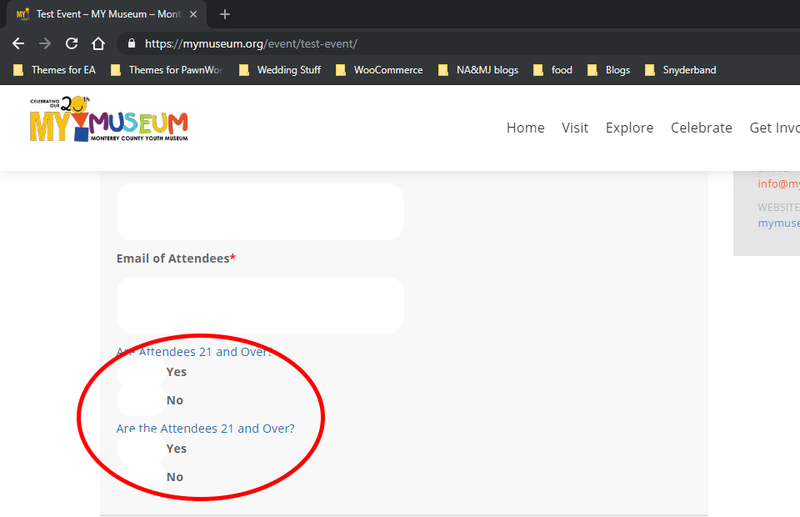 We’re having trouble with the checkboxes and radio buttons not working on the RSVP form that pops up when you select a ticket on on of our events. Thanks for emailing support and sorry you are having issues. Sounds like there is a conflict and looking at this page I see a few console errors with some called “fancybox”. To get you started on troubleshooting: First, please make sure you are using the most current versions of all of our plugins. You can also try reinstalling them by following these instructions. If that doesn’t help, the next step in troubleshooting this is going to be testing for conflicts with your theme and other plugins (with WP_DEBUG enabled). If you need a testing environment, the free WP Staging plugin will let you create a quick copy of your live site that you can use for testing. I tested everything according to the instructions and used the staging area plugin. Upon switching themes from SuperOwly to TwentySeventeen, the radio buttons worked correctly. When I tested the plugins, I deactivated them all (except the events calendar plugins) and the form to select the tickets completely disappeared. I have also verified that all of the events calendar plugins are up to date. From what I can see, it looks like there are some custom overrides with your theme. They must have some built-in functionality with our calendar. In cases like these, its most likely resolved if you update the theme to the latest version as well. If you are not able to do that then downgrade our plugins to the last version that worked with your current theme version. Let me know how that goes and don’t forget to make a backup of your site if you decide to upgrade the theme. We have updated the theme we’re using and the problem wasn’t resolved. As for downgrading the plugins, I’m not sure if the checkboxes or radio buttons have ever worked with the event tickets plus plugin because this is the first time we’ve created an event with tickets. Let me know what else we can do to get this resolved! You can also try installing this plugin to dequeue scripts from the calendar and see if that solves the issue. The link above does not work. Could you send a link that does so we can try this out? Here is a direct link to the plugin zip file. The ticket sales form disappears from the event page. Not sure, why they are disabled but you may want to try and switch up the stylesheet by going to Events > Settings > Display and choose a different stylesheet and see if that resolves the issue. Or you can find where this setting is located in your theme’s stylesheet and change it to display: inline;. One other note. There is an extension causing issues. Looks like its trying to load jqeury a second time. Its a visual composer extension called image hover effect. Try disabling that as well. We were able to change the code to inline and now the boxes show, but they don’t work correctly. You can’t make an actual selection, the check doesn’t show up when trying to check a box. I have disabled the plugin, but it still isn’t working unfortunately. I can see the checkboxes. I would reach out to your theme developer and see why there is CSS blocking global form fields on our code. You could go through and reverse all the blocks in CSS but they may have an easier solution for you. I see this theme overrides our default code and has made customizations to it. Cases like these, you can inform them developer custom overrides are causing these conflicts.